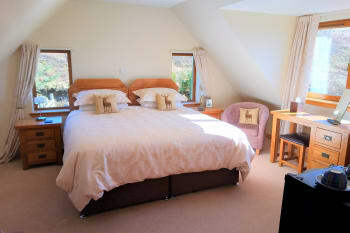 Cuil Lodge, bed and breakfast in Uig, offers a choice from three high quality bedrooms. We provide a standard double room, a large double room and a de-luxe double (or twin) room option. All rooms are en-suite with shower and WC, the deluxe room also has a bath for those who like a long soak after a hard day! Guests also have use of the dining/sitting room, lounge, and the conservatory. We offer a wide choice of breakfast options each day, including the option to have it early if guests need to catch ferries etc. Check in time is from 4.00pm onwards. We can be flexible for late arrivals but we prefer that guests let us know at the time of booking if they will be arriving after 8.00pm. We had a fabulous and far too short time at Cuil Lodge, and we hope to be back! Sandy and Margaret, you are wonderful, a home from home without it being weird :D I loved the room, the attendtion to detail, the tips on where to go, and the stories :D Watching a great northern diver in the bay was a priveledge too. Staying with you was a real pleasure, and much nicer than some of the hotels we’ve stayed in during our trip. You are both warm and welcoming, but also respectful of our privacy. I so appreciated the effort to provide gluten-free baked goods—what a delicious treat. The room was beautifully appointed and every need had been anticipated. Thank you for a lovely stay and a great memory. We had a short stay, but enjoyed dinner at the nearby Uig Hotel. Travelled to see the Life on Skye Museum and found it very interesting. On the way off the Peninsula, we had lunch at the Gasta deli near Broadford, which was very good. Sadly, we made our way to the Glenview B&B and wool shop to find them closed. Maybe next time! A great place to stay. It‘s quiet, the landscape is beautiful and Margaret and Sandy are fantastic hosts. Thank you M for taking the time to provide your feedback. You were very easy to look after! We hope to see you again some time. What a lovely place. Sandy & Margaret are very attentive hosts, extremely comfy bed, fabulous breakfast and lots of thoughtful extras, Highly recommend! Cuil Lodge has consistently maintained very high standards while remaining low key and welcoming of all its visitors, I have stayed here every year for two weeks since they opened and have been always favorably impressed. Uig is a lovely inlet. If the weather is good drive around the headland. Only two watering holes the Ferryman inn and the Uig hotel. Best to book. Cuil Lodge exceeded all of my expectations whilst staying in Skye again this year. The location is fantastic down near the water, across from the pier in Uig. Upon arriving I was greeted by the wonderful Staffa, who if I had read my emails in time would have found out is Cuil Lodge's resident man's best friend, and she's fantastic. During my stay, Margaret and Sandy were always doing their best to make me comfortable and get the most out of my time in Skye. They're interested in what you're planning to do and/or have done and go the extra mile(home made cake and tea after a day walking - amazing!). The amount of hard work that goes into making breakfast is astounding. I'm sure you could count on one hand the number of locations that offer home made Granola and Tattie Scones , amongst a host of other home made treats. 5 stars is apparently as many as I can give, so that will have to do. If you are considering anywhere to stay in Skye, Cuil Lodge has to be one of the best places to spend your time on the idyllic Isle. Very pleasant hosts, lovely accommodation, great breakfast, beautiful view... at the end of a long drive what more could you ask for? Faultless comfortable accommodation, lovely hosts and an endearing dog (hello Staffa). Thank you Sandy and Margaret for making our stay so pleasant, we hope to be back. Ferry Inn and the Uig Hotel, both good but different styles of food. Beautiful lodge, excellent location, wonderful harbor views, delicious breakfast, and easy to find. Hosts Sandy and Margaret were friendly and very informative regarding nearby restaurants and activities. A nice selection of DVD movies is provided. Staffa the Weimaraner is the perfect mascot! Thank you for a wonderful stay! Book early - this B&B is in high demand! our one regret we could only stay one night. A wonderful experience with friendly hosts. Very friendly hosts with plenty of advice on the local area. Drying of wet weather walking gear was a bonus. Lovely breakfast and home-made treats (fudge, cake and biscuits). Uig Hotel for dinner is within walking distance. Plenty of walks within easy driving distance. Both Sandy and Margaret and not forgetting Staffa the dog were very welcoming and hospitable. We were sorry it was only brief but very comfortable stay prior to our return home following our holiday North Uist. We would love to stay again should we return to the islands but were disappointed on reading your web site that minimum stays of two nights are being introduced from May to September next year. We appreciate your reasoning for this and wish you well. We had dinner in The Uig hotel which was very enjoyable. Prior booking is recommended. Excellent hosts, wonderful, warm, always entertaining and great source of local knowledge. Spotlessly clean, luxury accommodation and the most comfortable bed imaginable, all set within superb scenery. I wouldn't want to stay anywhere else. Cuil Lodge was far and away the nicest place we stayed on our 10 night visit to Scotland. The setting is beautiful and the lodge is superb. Sandy and his wife keep everything top of the line and spotless. All amenities are first class. The breakfast was varied and excellent, and the local eating options were good. Add a ++ to all those 5's above. We chose Cuil Lodge initially because of handiness for the Tarbert ferry BUT having now had the Borland experience, the welcome cuppa and home baking, the attention to detail in the guest rooms, Margaret's own breakfast Granola followed by a wonderful choice of cooked dishes - there is no other B&B we've tried that compares. Sandy and Margaret have a wealth of information about the area and only too willing to help, even to making meal reservations for us in advance to avoid disappointment. Eg the only hotel open during our stay was the Uig Hotel and without that info from Sandy's we'd have been stuck as the hotel was so busy they were turning people away. One of the best B&Bs we have come across and we have seen many all over in the last 35 years. Our hosts Sandy and Margaret love what they do and it shows.This place is G R E A T ! No wonder it is so hard to book ahead, word gets around quickly. The Uig hotel nearby was very good for supper meal. We loved our stay at this B&B! It feels like home! The owners are great and nice people and we love Staffa! It’s nice to have a dog around the house! The breakfast was very good and the services too! Homemade cookies, cake and candy!! Lovely! The owners answered all of our questions and we had a lot of nice conversations! The B&B was beautiful, clean, nice and cozy! We recommend this place dearly! The sight was beautiful! We love to come back someday! The only local restaurant at the moment is the Uig Hotel-restaurant. Don’t forget to make a reservation! But you can read this all on the website of the B&B! Portree is a nice little town to go to. Fairy Glen, The Old man of storr and the fairy pools are the most beautiful things/places to see in the area. Isle of Sky is beautiful, even when it rains! We just stayed one night and we'd like to be there for more days. We are sure we will come back again! Near the lodge there are 2 of the best restaurants in Uig: The Uig Hotel Restaurant and the Ferry Inn. The second one is very small so we suggest to book a lot in advance to be sure to have a seat! the owner/staff was very friendly and helpful, gave su some tipps, smaltalk, Welcome Coffe and Cake, great location, we will come again!! A very polite, helpful welcome. Beautiful room and facilities. Delicious breakfast Beautifully and tastefully decorated residence. We were really happy to know Margaret, Sandy and their wonderfull house. We hope to travel again to Skye: it's so beautiful place that also the scottish weather seems beautiful!!! Second time we have stayed there and we're pretty sure we'll come back again in the future. One of the best places to spend a few days and explore Skye. Wonderful hosts, great location and superb breakfast! Fantastic tips on where to go and what not to miss too. 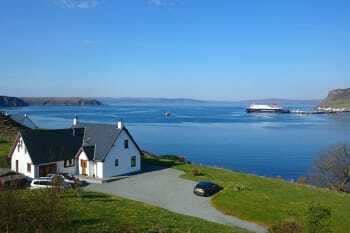 A lovely cozy home with wonderful views of Uig Bay and the ferry dock. Minutes from the village of Uig and a pleasant drive to Portree. Sandy and Margaret are attentive and friendly hosts and made my stay interesting and enjoyable. I would definitely return to Cuil Lodge if given the opportunity to do so. Dinners at Uig Hotel were amazing. I bought several souvenirs at the Uig Pottery store and workshop. A wonderful stay. The home is very fine; location, cleanliness, facilities and owners are simply perfect. The rooms are very comfortable and accessoried with everything can be useful. The breakfast is great, mostly the porridge that is delicious!!! Sandy and Margaret, splendid persons! Added value : their dog, Staffa. We had dinner at Uig Hotel, very close to the home, it's a very nice restaurant. The smoked salmon was great and also the sweets. Friendly and welcoming. High quality fixtures and fittings excellent food. Really quality B & B with warm, friendly hosts. Very good location for the ferry. There is a hotel that provide food about 10 minutes walk away. Beautiful B&B. Sandy and Margaret were amazing hosts. They shared their knowledge of the area and gave us ideas for our adventure on the Isle of Skye. The accommodation and wonderful breakfast was all you could ask for. Wish we had a few more days to spend there! We basically did a drive to various areas. The Highland Games were on so Portree wasn't an option as there was no parking anywhere. I have provided a full review at tripadvisor.com of this establishment. This is a stunning B&B. 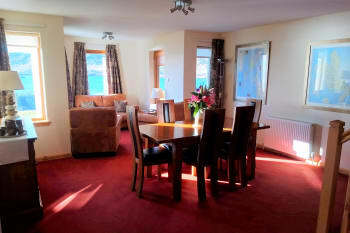 Sandy and Margaret run a very comfortable Lodge in a beautiful setting facing Uig Bay. Our only regret is that we wished we could have rearranged our travel plans to stay longer. We would surely recommend Cuil Lodge to others who wish to stay on Skye. In advance, contact Sandy and Margaret about dining options for dinner. They kindly made reservations for us at The Uig Hotel. Just know that Uig itself has a limited number of restaurants. Very pleasant to stay in this lodge. Nice homebacked sweets and excellent breakfast by Margareth. Good tips from Sandy for avoiding the crowds on Skye. Eating in the FerryInn, best kitchen we have had in our three weeks tour through Scotland. So friendly and welcoming, will definitely be back. The Ferry Inn, but book in advance as it is popular. we stayed at Cuil Lodge for 2 nights. Beautiful big room with everything we would need and more. Sea on your front door. Fantastic breakfast served each morning in a very relaxed environment. Felt very much at home. Sandy and Margaret were a delight to stay with. they could not do enough for us. When (not if) I go back to Skye I will definitely book Cuil Lodge Accommodation. We thoroughly enjoyed travelling around the Isle of Skye for 2 days and tried to fit in as much sightseeing as possible. so much to see and do. Cuil Lodge is a truly lovely B & B. Beautiful location with wonderful views, a super house with great rooms and fantastic hospitality. Sandy and Margaret are excellent hosts. The Ferry Inn is our favourite local restaurant - but you need to book! Very enjoyable stay and we hope to come back next time we are in Scotland. Great walks nearby and the Hotel had good food. Perfect stop off for the Ferry to Harris. Very friendly welcome and good location. Every thing was lovely. Fantastic view from our room. Next time we would like to stay a bit longer! We had a very nice meal at the Big Hotel. Perfect hosts who go out of their way to ensure that you have an enjoyable and comfortable stay. A really lovely B&B in a great setting - ideal for exploring Skye. Sandy and Margaret are great hosts and do everything possible to make their guests welcome. Perfect stay. We would like to come back one day. Thanks to Sandy and Margaret. Margaret and Sandy are very friendly and welcoming, they have thought of everything to make your stay more than comfortable. Of our 7 BB’s on our road trip through Scotland I’d rate it our favourite! We really enjoyed our visit - one of the highlights of our trip. Wish there was a 5+ cleanliness rating. Beautiful surroundings and lots of areas in the house for guests to enjoy them. Comfy beds and delicious breakfast. Absolutely amazing! Breathtaking views and sunset! Breakfast was delicious and Sandy & Margaret couldn't have been more helpful. Gave great directions and were really good company. Wish we had had more than one night stay with them. Oh, they have the sweetest dog that greeted us too ;) we will definitely be staying here again on our next visit and will recommend to anyone planning a trip that way! Everything was verry good. Perfect bedroom. Fantastic breakfast Greetings Cees and Riet. That’s our second time here. There make you your at home, we loved it. Ferry Inn Gordon is the owner, fantastic food and Harris Gin of course. There’s so much to see on Skye so take a few days at lt. Superb B&B in amazing location. Very friendly hosts. Would definitely recommend to friends. 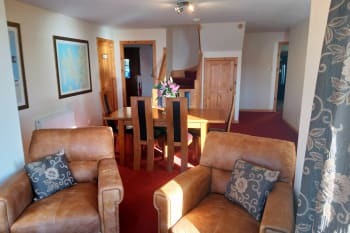 Cuil Lodge is the perfect place to be in Skye! We had such a warm welcome and none of our wishes was too much effort. Margaret and Sandy are the nicest hosts you can imagine. Not to forget Staffa, their lovely Weimeraner. Margaret even baked lactose-free cookies for my wife! 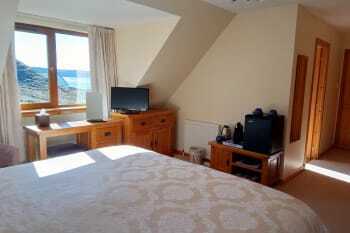 The room was nice and clean and offered a marvellous view over the sea. We only had one night at this lovely place, but if you are in Skye, Cuil Lodge is easily the best place to be! An A plus establishment with A+++ host and hostess. Nothing was too much trouble. Sure I have added weight from the breakfasts and those afternoon teas! Nothing about this accommodation is anything but outstanding. Absolutely fantastic stay at an incredible B&B. The house is in a lovely spot looking over the bay. Margaret and Sandy are brilliant hosts and the breakfasts were great. Make sure to book dinners at local restaurants in advance as there are not many in/near Uig and they're always full (in summer). Margaret and Sandy were some of the nicest people we have ever met. I could not imagine a better place to stay when in Skye. Great bed and breakfast in superb location. We had a warm welcome from Margaret with delicious cake served with tea or coffee. Great choice for breakfast really enjoyed Margaret's granola sundae. We ate at both the Uig Hotel and The Ferry In and both meals were very good. We booked both in advance. Ideal location for catching the ferry. A great place to stay with friendly hosts and home baked afternoon teas!! Very friendly, warm welcome. Very comfortable bed. Breakfast was delicious. Sadly we were only able to stay en route to the next ferry. Would like to return and stay longer. We spent 3 days at the Cuil Lodge B&B in early June. It felt like home to us. Margaret and Sandy are outstanding, friendly hosts. They were very welcoming and have great knowledge and advice about Skye. The B&B is modern and feels like new. It is spacious, clean, well organized, and in an incredibly beautiful location with a great view. Breakfast each morning was fantastic. We will miss our times talking with Margaret & Sandy and petting Staffa, but will cherish our memories. It was truly our best holiday experience. Thanks again! So much to do and see in Skye. An incredibly beautiful place in the world. Our stay was, unfortunately, too short. However, while we were there it was very nice. Margaret and Sandy are wonderful hosts, and the area is beautiful. Hopefully, we can return for a longer stay next time! The entire Isle of Skye is amazing. If you like photography, would recommend a photo tour with Marcus McAdams company—excellent! Very welcoming and accommodating. Nice little touches and very attentive to every need. Would recommend to others. Great location and easy to get to sights such as fairy Glenn and old man of store. Absolutely the best B&B on our whole trip through Scotland. Extremely high levels in every aspect! Thanks for the homemade pralines in our fridge, desr Margret! Enjoyed everything very much. Wished we could stay for lomger. Next time! Definitely! The Restaurant nearby, The Ferry Inn, we can highly,recommend. Everything about Cuil Lodge is spectacular! The rooms, the location, the breakfast, the hosts (including their dog!) and overall atmosphere. The best tip from Sandy & Margaret was to travel north along the west coast and then down the east side for the most scenic views of Skye. It was amazing! A most amazing and relaxing place to stay. Nothing is too much trouble for Margaret and Sandy...I even got to play my own CD. I find that a good test of an excellent B & B is whether there is fresh milk in the room and there was. Also tea and cake provided on arrival. The breakfast was indescribably good with a choice that included smoked haddock. I could go on...as most friends know...but I won't. I am sure you get the picture. PS - for those concerned about the dog Staffa once met is as gentle as a puppy. Just needs to say hello first!! The Ferry Inn was my choice for supper and a very good one too. Service with a smile and tasty food in a lovely location at the head of the bay. As you would expect a good selection of single malts too!! We had a wonderful stay. The many personalized touches Sandy and Margaret provided - tea and cake, wonderful breakfasts, lovely toiletries, adequate parking, suggestions and information about anything we needed - added so much to the experience. The room and property were truly lovely. It would be wonderful to wake up with that view every day! The Ferry Inn was our favorite restaurant among all that we tried on a 3-week trip. The Uig Hotel Restaurant was also very, very good. The walk to Coire Lagan was absolutely beautiful. The most amazing hosts and a lovely house, superbly made up, spotlessly clean and a breakfast from heaven!! We loved it so much here and can higly recommend Cuil Lodge to anyone who appreciates warm hospitality and fantastic class and service! Like the Tina Turner song, “Simply the Best, Better than All the Rest” describes the Cuil Lodge! There is nothing overlooked and everything – the room, the view, Staffa the dog, and Sandy & Margaret were fantastic. I was extremely impressed with the attention to detail. It was also the only place we stayed that had a refrigerator in the room. Breakfast was also outstanding. Margaret had homemade candies in the fridge and butter-sugar cookies in a jar by the coffee and tea. We have stayed at a lot of places around the world and there is no doubt that this is the best B&B we have EVER stayed at. Plus, it was extremely reasonable at only £140 per night for the largest room. There are not many options for dinner in Uig - we ate at the Uig Hotel and Ferry Inn. Both were good but town was much smaller than we expected. Absolutely fabulous place to stay. Margaret and Sandy can advise you on places to go, things to look out for and are just generally a great source of information about the island. Great hospitality and food. Love the homemade cake!! Everything was brilliant - thank you. Superb in every way. An extremely warm welcome and a very fine room overlooking the sea. We would return without hesitation. Beautiful location and facilities. One of the best B&B we stayed this trip. Bed was so comfortable. Will be back. Book early. Stay more than one night. Excellent place to stay. Warm, welcoming and friendly. There are only two places to eat in Cuil...The Ferry Inn and Uig Hotel. Booking for a meal is essential prior to arrival in Cuil. Ferry Inn good for dinner. excellent accommodation and food ; good sized room. Welcoming and friendly hosts. Comfortable and quiet. Very good breakfast, recommend the porridge. Convenient for the ferry. Warm welkom, beautiful location! Margaret and Sandy were very helpful and we liked Staffa their dog. Lovely home. Great hosts - extremely welcoming and very helpful. Book the largest room and stay for several nights! Our 4th stay at Cuil Lodge and still as excellent as ever - we were one of the first guests Sandy & Margaret welcomed to Cuil Lodge when they opened 4 years ago and we have been coming every year since, always as a stopover before taking the ferry to Harris the following morning. The room, the service and the food are all second to none, not to mention the convenience for the ferry terminal which is less than 5 minutes away. Perfect - we'll be back again next year. The Ferry Inn is now open for food as well as drink and is reportedly very good; the Uig Hotel, just up the hill from Cuil Lodge, remains as good as ever but wins on the view from the indoor sun terrace - perfect for watching the sunset over a pint of Black Skye Brewery Real Ale and high quality staple pub food. Meal at the Ferry Inn was great and a lovely setting, very easy to walk along to from Cuil Lodge. Brilliant! Excellent specialist attention to special dietary needs also. We will be back. First Class accommodation. No complaints whatsoever. Ferry Inn is excellent choice for dinner. Hi R & N, glad you had a good time, it was great having you here. All the best. Sandy & Margaret. Sandy and Margaret were such generous and kind hosts who set the high standard of service, assistance, and hospitality for our trip. We felt quite at home and were so happy to have genuine conversation with both of them. Thank you for everything. We really hope to be back soon. We absolutely loved our hike to Rubha Hunnish to start our trip to Skye. It was just us and featured some of the most spectacular views. We felt right at home and like we could see ourselves living in Skye. We also loved walking everywhere around Uig whether to dinner or to Fairy Glen. Go at sunset! Pure magic. Hi C&L, we're very glad you had a good time. It was great having you stay with us, we very much enjoyed chatting with you. Hope you have a great time on the remainder of your holiday. All the best. Sandy, Margaret, and 'Staffa'. We had dinner at the Ferry Inn just down the street. Wonderful restaurant with warm and inviting decor, friendly, attentive staff and a menu to suit tastes. We would visit again. We really enjoyed to stay in your home and it was a pleasure to meet you. Lovely B&B, beautiful location, very clean and neat, great breakfast. Fairy glen is 2 minutes away and worth a visit, Uig hotel had good food but was dated and service slow, Ferry Inn had excellent food and great service. We stayed here as we needed to catch the ferry for Harris so the location was excellent . Our large double room was very well equipped and the bed of good quality and very comfortable. A range of tea and coffee making facilities were available as was homemade shortbread and sweets. Hosts were welcoming . Breakfast was good and can be served when you need it which is very helpful. Check in is 4 pm which i think is a bit late but this can be negotiated I believe. We are not sure if we have ever met such kind and welcoming hosts before. You can see that Margaret and Sandy run their lodge with love and professionality. They can tell you a lot about Skye and where to go. The lodge itself is situated very well on the opposite site of Uig Harbour: You can see the Ferries arrive and depart. The Uig Hotel is 3 minutes drive away and has a diverse and delicious menu. Popular tourist spots like the Quiraing and The Old Man of Storr are not too far. The hosts can tell you about many other less known places to visit. Cuil Lodge is in a beautiful location. The lodge is immaculate and room was well equipped. Everything was above and beyond what we expected. Thank you for sharing Cuil Lodge with us! The Uig Hotel had great food, but the service is a little slow. Don't go there to eat in a rush! Check out Uig Pottery nearby. Beautiful items and very reasonably priced. We enjoyed visiting the Fairy Glen, Fairy Pools, Old Man of Storr, Dunvegan Castle, shopping in Portree, and a trip to Elgol. Sandy and Margaret are exceptional hosts as well as their well trained dog Staffa. It was a treat to stay there and we are planning to go there again. The views from the house are wonderful. Food was great and mingling with other guests was made easy. The location in Uig on the Isle of Skye is away from all the hubbub of Portree and is beautiful. It was one of the bright highlights of our trip. Dinner at the recommended Uig Hotel, walkable from the B & B was very good. Uig is a nice quiet spot away from the tourist center of Portree, yet not too far should you desire to spend time there. Fantastic location. Sandy and Margaret pay every attention to detail and went out of their way to help when my husband had an injury after a fall. Skye Tours mini bus trips are great for seeing the island. Picked us up from Cuil Lodge. Hello A&C, sounds like you made it home. We hope the journey was better than you thought it was going to be. We hope C is recovering well and it's no more than some soft tissue damage. The perils of walking in wet/slippy conditions! All the best for a speedy recovery. Sandy and Margaret gave us the usual personal and welcoming experience (and carrot cake) which makes a stay a Cuil Lodge so relaxing and comfortable. Food at Uig Hotel good - would advise booking in advance for dinner. Sandy and Margaret were excellent hosts that made us feel very welcome and very well looked after. Our room was amazing (we stayed in Sleat), spotlessly clean, well appointed and had a very comfortable KS bed. Margaret had even baked cookies and sweets for each room which were yummy. Sandy was most helpful and informative and he made sure each day's activities were jam packed with spectacular scenery and great food. Breakfast was terrific with excellent service. The attention to detail at Cuil Lodge is brilliant. If you're staying in Skye, stay here. Sandy and Margaret are wonderful hosts and go out if their way to ensure you are comfortable. Breakfast superb with a wide choice available. Definitely be back. Great stopover if catching ferry to outer Hebrides. Wonderful lodge in a wonderful location with wonderful hosts! Turntable Ferry from Glenelg to Kylerhea, single track roads, Single Track Cafe. 1.5 days is not nearly enough to explore Skye -- allow plenty of time to wander, hike, etc. Everything about Cuil Lodge just oozes quality. It is obvious the owners are proud of their beautiful home, and justifiably so. The bedroom was superb, every comfort catered for, right down to bathrobes; not that we used them as we were there only one night. Delicious breakfast next morning set us up nicely for our journey to Harris. The view from the house is wonderful. Would we go back? Certainly! Would we recommend to friends and family? Absolutely! If you're in Uig, look no further. Hello A&P. Many thanks for finding time to write about us, it's much appreciated. Hope you had a great time in the outer islands. wunderschönes, stilvoll eingerichtetes B&B direkt am Meer; sehr nette Gastgeber, super-leckeres Frühstück (unbedingt Früchte mit Joghurt als Starter probieren!!! ); wir fühlten uns sehr willkommen, trotz unserer nicht perfekten Englischkenntnisse; ein guter Platz um mehrere Nächte zu verbringen; man fühlt sich sehr 'zu Hause'; To Margaret and Sandy: Thanks a lot again for your warm hospitality - we enjoyed our stay at Cuillodge and dream about coming back someday !!?? Sandy and Margaret were delightful hosts; we had numerous insightful chats that greatly enhanced our experiences on Skye. The house and site were exceptional and the breakfasts were excellent. We could not recommend Cuil Lodge more highly! Our meal at the Uig Hotel was excellent. sehr freundliche und liebenswerte Gastgeber, toller Hund! Die Lage ist genial, um den nördlichen Teil der Insel zu erkunden. Ich würde wiederkommen. Warm welcome. Very nice and friendly hosts. Great hospitality, outstanding service, good food. Txs for recommanding and making reservation for us at excellent restaurant nereby. Great location with a stunning view on Uig Bay with fantastic hosts Sandy & Margaret (and of course Staffa, the lovely dog). Very spacious, luxury and clean en suite rooms with lots of facilities like coffee machine, fresh water and milk in the fridge and of course, not to forget, Margarets delicious home made sweets! Very, very good breakfast which meets everybody's taste. Sandy & Margaret are very attentive and invest lots of time to give advise where to go to on the island and make the guests stay unforgettable. Unfortunately we stayed at Cuil Lodge only for two nights. Wish we would have had the possibility to stay longer. Cuil Lodge is the "Must Go To Place" on Skye! The people and accommodations were excellent. Very friendly and comfortable beds. The views were outstanding. Margaret and Sandy were perfect hosts, and beyond any expectations we had. There was attention to detail - from the fresh milk in the fridge in each room, to the his + hers dressing gowns, the q-tips and toiletries. Cups/teapots seemed to be locally sourced from Uig. We were even offered tea/coffee and cake when we arrived. And then, they offered to dry out coats and trousers after our walk up Ben Nevis. We had to leave for the very early ferry in the morning, so we missed the delicious breakfast :( Which Margaret and Sandy got up for to make sure we were ok. The tips on visiting Harris were excellent too. Can't recommend highly enough! If you go out for dinner in the evening you might need a torch - Margaret and Sandy offered to lend us one. There isn't that much to do in Uig. We were told to avoid the Pier Restaurant. We were recommended the Uig Hotel which was not bad (lovely decor). The B&B is very close to the Fairy Glen, and of course the ferry to Harris! The ferry port is literally 3 minutes away by car. Lovely inviting home and lovely people. Great fresh food for breakfasts. With two good pub/restaurants just up the road in walking distance evening meals readily available. Great advice given by Sandy & Margaret on tours and places to see. Sandy and Margaret gave us a wonderful experience when we stayed at Cuil Lodge. They were very helpful, open and friendly. The accommodation was spotlessly clean. The breakfast was cooked to perfection. Staffa was full of personality and friendliness. Thank you for your wonderful place. We ate at the Ferry Inn each night. The staff were so friendly and service was excellent. The food is very good. Just one thing to note - the menu is quite limited. The Lewis island is beautiful. And Portree i also very nice. A good tipp for all travelers: make a reservation for the dinner! A very warm welcome from our hosts Sandy and Margaret. A lovely room with views over the bay, and an excellent breakfast. Ideal location for the ferry. We had a lovely evening meal at the Uig Hotel - as recommended by Sandy. A fantastic B&B with everything you need and more. We really enjoyed our stay here. Sandy and Margaret were very kind and we were pampered during our stay. Watch a blue ray DVD in the lounge room or, just enjoy the views. Satnav on zip code might send you the wrong way. Look for signs. Coming from the ferry, it's the next exit after the post office. Coming from the main land, watch for the signs on the left side of the road. We thoroughly enjoyed our stay at Cuil Lodge. The hospitality offered by Sandy and Margaret was exceptional. Delightful rooms, cleanliness, delicious food and lots of extra touches and attention to detail made this a truly excellent 'B & B'! We would certainly recommend this accommodation. Consider the Ferry Inn for a local evening meal - we certainly enjoyed the food there. The road north enables you to visit the Museum of Highland Life, Flora MacDonald's memorial and then further round approaching Portree, the Kilt Waterfall and Old Man of Stoer - worth getting a closer look if you're feeling energetic. Neist Point has excellent views on a clear day. Worth booking in advance for Talisker Distillery tours. Cuil Lodge is one of the finest B&Bs we have ever stayed in with everything of the highest quality right down to thoughtful details. The views from the public areas and our bedroom were wonderful and it is perfectly located for the Uig ferry. Sandy and Margaret are superb hosts, very welcoming and very friendly in all respects. Is was a real pleasure to stay there and our only regret was that it was for 1 night only - we will be back! Perfect for the Uig ferry - 2-3 minutes drive. Thank you for your advice. We enjoyed all the way to driving to the Inverness.So beautiful.I wish I could stay another night. Mairi and I thoroughly enjoyed our stay and found you both very hospitable and welcoming - couldn't ask for better. We loved the Inn for dinner, very friendly. Thank you for the welcome, the service and the friendliness. It was all just perfect! Boat trips from Elgol ... fabulous. Eating out .... remember to book. Don't be in a rush to 'do' everything. Don't fill up with letrol before the bridge ... prices are just as cheap on Skye as the mainland. Thanks for coming to stay C. It was a pleasure having you here. Your biggest fan is missing you! Cuil Lodge is a wonderful place to stay. You receive the warmest of welcomes from Sandy and Margaret who clearly work extremely hard and take great pride in their beautifully presented home. Everything you could need and more. - Enjoy the warm welcome from Sandy, Margaret and Staffa. - Try the handmade sweet and cookies by Margaret. - Enjoy the afternoon cake by Margaret. - Get to Cuil Lodge earlier before darkness to ensure you could find the direction sign easily. Beautiful place to stay, wonderful hosts (that includes Staffa!) and lots of extra touches to make your stay memorable. The standard of accommodation was exceptional, an immaculate home with a very warm welcome. Unfortunately we were only there for one night, breaking our journey after travelling over from North Uist, before continuing down into Cumbria. We did telephone and ask Sandy about a reservation for dinner, he kindly booked a table for us at The Ferry Inn and sent us a text to confirm the details, which was a great help when arriving in the evening and not knowing the area - we had a lovely meal. When we will come second time to Scotland we know where we will stay for longer ! A perfect stay with very friendly owners. A wonderful place in a lovely bay on a magical Island. trust in the tips from Sandy and Margaret. Faultless. If you want to stay in the area, stay here. Wonderful stay. Sandy and Margaret were very hospitable and helpful. The house and rooms are immaculate. Great breakfast. Sandy and Margaret are very knowledgable about the area. Their advice was very useful in deciding what to do. Sandy & Margaret make the difference. Superb B&B! The Ferry Inn is a must visit! Very kind cuple who runs this b&b. Very helpful with suggestions. Tried very hard to make our stay excellent. First class B&B, excellent service and lots of little extras from home baked treats to own branded toiletries. Margaret & Sandy were very knowledgeable about the area and helpful looking further afield to help. Wish we could have stayed longer. Thank you I&R, much appreciated. Looks like the weather held good for your cycling activities, we hope you have had a great time on the outer islands. Sandy & Margaret. There were four of us staying at Cuil Lodge and every one of us feel as though we won the Bed & Breakfast lottery! It was such a wonderful experience! Margaret and Sandy are the most gracious hosts! The breakfasts were made to order, delicious and generous! The rooms were spotless, so comfortable, each with a gorgeous view! We were close to all the sites, sights ;-) and activities we wanted on Skye, plus a very short stroll away from a little market and a couple great places to grab dinner and/or drinks in the evening. Margaret is an amazing cook/baker and delightful treats magically appeared every day in our rooms and whenever we wandered downstairs to hang out in the lovely conservatory...which was often...you know...because who can pass up tasty goodies and great conversation with awesome people...in a conservatory...overlooking the bay?!?) If you EVER have the opportunity to visit Skye and Cuil Lodge has a room available...stay there! Win the Bed and Breakfast lottery, and please tell Sandy and Margaret "hello" from the four of us! Hello S, J, M and B. It was fun having you guys here. We're glad you had a good time. Hope you made the next leg of your journey safely and hope to hear about your day trips out of Edinburgh, if you have the time to share them. Thank you so much for taking the time to write your feedback here, we really appreciate it. Lovely friendly welcome. Margaret booked our table at the Ferry Inn for dinner. Beautiful house and room with home made tablet, delicious. Early breakfast required? No problem, lots of choice and equally as good as the tablet! Try the Ferry Inn for evening meal, fresh seafood daily. Lots to see on Skye, but for us this time we were passing through to the Western Isles. Warm and friendly hosts and superb hospitality. Perfect location for us to get the ferry over to Outer Hebs. Would definitely stay there again and recommend them....and their breakfast. we only stayed 1 night but Sandy and Margaret are full of information on Skye and will be able to give you all the tips/direction you need. They even have the menues of 2 good eateries in the area... Uig hotel (where we went and was very good)....Ferry Inn is closed Sunday and Monday. Many thanks A&S for coming to stay with us, we're glad you enjoyed your time here. Update on the 'Ferry Inn', it's now open on a Sunday afternoon for 'brunch', and is also now open on a Monday. All the best, Sandy & Margaret. Cortesia cordialità buona prima colazione Camera con vista e pulizia curata. Situato in prossimità del traghetto per le Ebridi e vicino ai migliori ristoranti della cittadina di Uig. Ottima location per le escursioni sulle vicine Quiroig. Grazie mille!, Massimo & Antonella. Godetevi le vostre vacanze. Beautiful and impeccably kept B & B! Lovely to be greeted by hosts with cake and tea/coffee! Enjoyed the view of the harbor even from our bedrooms. Thank you all for coming! We hope the journey to Edinburgh didn't take till 10.00pm after all :D All the best, Sandy & Margaret. Margaret, Sandy and Staffer made our stay a phenomenal one. Most wonderful people, and a dog, you could ever meet. Their home is comfortable, stress free, and you feel like family. Stay in the king ensuite room. More than worth the cost. Breakfast is phenomenal . Have Margaret's granola, yogurt and berries sundae. We're glad you enjoyed your stay guys. It was fun having you all here. Enjoy the rest of your travels, ad safe journey home. All the best. Sandy, Margaret and 'Staffa'. Sandy and Margaret were great hosts, very welcoming. Breakfast was outstanding, they catered to all our requirements. Very relaxed atmosphere, lovely rooms with outstanding views and the best power showers ever ! Margaret and Sandy helped us with information, places to visit and made our stay really lovely ! It was a pleasure to stay with them. Go to St Kilda, if the weather allows !!!!! Sandy & Margaret are the most wonderful hosts and made our stay the highlight of our travels around Scotland. Nothing was too much trouble and the quality of the facilities was second to none. Sandy & Margaret will guide you to the best places! Thank you C&F, we really enjoyed your company. Happy travelling! Uig is a dramatically picturesque town and the roads there provide some of the best scenery in the world. 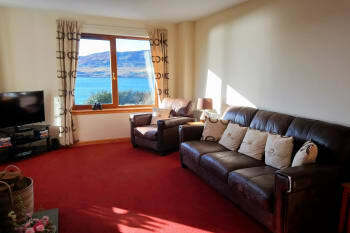 Cuil Lodge is spacious with a wonderful sun room and excellent views over the bay. The rooms were clean, large and equipped with all you need. The breakfasts were first rate. More importantly, the hosts are just a delightful couple. It was a real pleasure to stay and if we do manage to get back to Skye, we will definitely stay again. Uig Hotel very pleasant, but book for dinner. Laundromat at the Cowshed with best views for a beer while you wait. Take you time in Skye..its not a place to rush around. Hope you get the weather we had. Thank you M&M, very kind of you to take the time to post your comments on here. We really appreciate that. We hope you're enjoying the rest of your trip, safe travels back to Oz. 5 star hotel quality in a B and B is a great accolade. Lots of lovely touches and details (home made chocs, short bread, bathroom stuff, DVDs if you wanted) plus very friendly and helpful couple. Thank you Sandy and Margaret..and Staffin! Go to the newly refurbished Ferry Inn for a limited but exceptionally well done menu and good value. If you want the wider menu try the Uig Hotel. Both need booking in busy times. Thank you A for your feedback. It was a pleasure having the four of you stay with us. We hope you managed to fit all the things in you wanted to before heading back South again. A wonderful place to stay. Clean comfortable and a nice view. Breakfast truly excellent (even if black pudding was a late arrival!) Would stay again. Hosts couldn't have been more helpful and accommodating. Were helpful in advising places for an evening meal AND so thoughtful about parking a motorcycle on gravel safely. Hi M, thanks for taking time out to write a few lines about us. We appreciate the feedback. Yes, motorcycles can be tricky. We have a few spots where the ground is hard and you can get the stand on a solid base. Getting a bike moving out of three or four inches of gravel is no fun! All the best. Tip top B&B - maintained to a very high standard. Hosts very welcoming and happy to help / accommodate. Would highly recommend. Ferry Inn (walkable) for evening dinner is excellent. Make sure you book or you will likely be disappointed. We were lucky enough to see our first otter ever from the bedroom window at dusk. The house is beautifully situated overlooking the bay and the ferry terminal. Thank you B&K, we're glad the otter made an appearance for you! It's normally quite shy but has been around recently. Well done for spotting it. Sandy and Margaret are very nice people and we enjoyed the stay with them a lot. We also like the location of the house as we can overlook the sea. Hi V&W, thanks for your lovely comments. Hope you made it to Glasgow and Liverpool safely, that's a long drive! All the best. Lovely welcome, beautiful home and very well fitted for accommodating guests. Rooms immaculate. Lovely breakfast, close attention to all detail. Hosts friendly and obliging in every way. Lovely view of the harbour and general scenery all of which is stunning. Can't praise highly enough would definitely go again. Lovely dog is resident, friendly but calm and unobtrusive. probably should know about it in case you have reservations about pets. Thank you K&M, was great having you both here. Thanks for taking the time to write your feedback, much appreciated. Wonderful in every way possible. Cuil Lodge is an exceptional place to stay in every respect, from the owners Sandy and Margaret (not forgetting Staffa their lovely dog) making sure that absolutely everything their guests might require are thought about right through to the quality of the furnishings and the comfort of the beds. And then there is the breakfast...you could have one suitable for slimming, but then you would miss all the other amazing elements. I may never return to Skye again, but if I did there is only one place I would contemplate choosing to stay. Cuil Lodge is utterly marvellous! 1. (For travellers from the USA) - it takes about SIX hours to travel from Glasgowe or Edinburgh, so don;t think that because they seem close on a map that you will travel any quicker than this. It takes over an hour to traverse the island up to Uig alone. 2. Do have your first evening meal at the Uig Inn which is close by Cuil Lodge. You will not be disappointed. with either the quality of the food or the prices charged. There are other very good eateries dotted around Skye but they ARE / can be expensive. 3. Apart from the Cuillins, the Trotternish Peninsula (which is where Uig is located) has some of the most spectacular scenery: especially down the north east coast. 4. Make sure to do the drive from Uig via the Quirang. Just do it!! We really appreciate all the comments you've made here, especially your 'Tips for other travellers'. Brilliant! Glad you had a good time here, and on Skye generally. We enjoyed having you with us. All the best guys. Sandy, Margaret and Staffa. It was so wonderful to stay with such warm and lovely people. We adored Margaret's sweets and everything was immaculate. Breakfast was great as well! Thanks for all the local tips and help planning parts of our journeys/stay. Uig Hotel was good for food, but service was quite slow on the day we were there. Thank you S&G for coming to stay with us, and for the kind words you've written here and other places. Much appreciated. Hope you enjoy the remainder of your travels, have a safe trip home. Beautiful, cozy home with hosts that made us feel very welcomed. Sandy, Margaret and Staffa were the friendliest and most accommodating of the 3 B&Bs in which we stayed during our time in Scotland. They are busy hosts, but they always had time to talk and give advice and info on places to visit. The food was great and Margaret surprised us with special treats for my birthday and my kids' wedding anniversary. We all highly recommend Cuil Lodge! We were there for 3 nights and there were 2 great restaurants to choose from within walking distance from the house, plus there were great walking paths nearby that my daughter-in-love enjoyed after dinner each evening. The view is beautiful and the house is quietly tucked away from the busy tourist bustle in nearby Portree. The rates were a little higher than others, but well worth it! Would definitely return to Cuil Lodge!! Hello C,N and J. It was great having you all here and we're glad you enjoyed your time in the area and your stay with us. Thank you for making time to write about us, we really appreciate this. All the best. Sandy & Margaret.........and Staffa. Great stay with very comfortable facilities and welcoming and friendly hosts. We had the most AMAZING stay at Cuil lodge. Sandy and Margaret were the nicest people we have ever met. The views were spectacular, the home was lovely, the room was so comfortable and shower was nice. We had tea, coffee and fresh milk in our room along with homemade treats made by Margaret. When we first arrived Margaret gave us cake and tea to hold us over until dinner. Sandy made a reservation for us at the nearest restaurant. We visited with the other guests in a common space. Their dog was absolutely adorable and friendly. Sandy gave us tips on hikes and things to do near by. The next two mornings we had amazing breakfast cooked by Margaret. When we came back from a day of sightseeing, our room had been cleaned and Margaret had even dried our wet clothes for us! I cannot begin to express how amazing this stay was. I would recommend it to everyone. Our only regret was that we only stayed 2 nights. We could have easily spent many more days here. Dinner at the Uig hotel was excellent. Call ahead to make a reservation as they book up. The skyebus tour is a must in Portree! We saw all the popular sights (Old Man of Storr, fairy pool, fairy glen, Quiarang mountain, the lighthouse etc) Also there are some nice places to eat in portree. We did quite a bit of walking around the town. I would also recommend hiking Quiarang and the Old Man of storr if you have time. We also took the ferry to Isle Of Harris. BEAUTIFUL! Thank you C&M. We're delighted you enjoyed your stay with us. Thanks also for taking time out to write about your experience, we really appreciate that. Also glad you enjoyed the Isle of Harris/Lewis. Have a safe trip home. We have stayed at many B&B's in several countries, and this one tops them all for comfort, attention to detail, and genuinely friendly innkeepers. The setting is beautiful as well. Sandy and Margaret went out of their way to make our stay perfect. Be sure to stay for more than one night! Hi guys, thank you so much for taking time out to review us. We're glad you all enjoyed your stay with us and we hope the remainder of your trip has been fantastic. Sandy & Margaret. Thanks for the feedback J&S. We hope your trip to St Kilda was everything you hoped it would be. We had a fabulous stay at Cuil Lodge. Margaret and Sandy are excellent hosts. From the first moment you feel the warm and genuine Scottish hospitality. Everything is spotless clean and the rooms are very comfortable and have everything you may need. Margaret is an excellent baker and offers cake tea and coffee in the afternoon. Sandy knows every information about the island and is always helpful. We will definitely return. This is the perfect place to stay for anyone catching a ferry (2 minutes away) ... but worth staying for longer to explore Skye. My wife and I enjoyed an excellent dinner at the nearby Uig Hotel. How could we fault anything at Cuil Lodge? We wish we had booked for more than one night! Hi K&M, great to hear from you. It was great having you both here, especially when you live so close to my Aussie relations and we can picture the beautiful area. Hope your onward travels have been good. All the best, Sandy & Margaret. To be honest We were there for very less time but enjoyed a lot with Sandy, Margaret and Staffa. The stay, the home, the location and the way to each there was itself a great experience. Wow! You remembered us :-) Thanks for taking the time to write your very kind comments. Margaret had mentioned that you commented/liked something on her Facebook page but now it makes sense that you're back in the UK. Hope you are having a good time........and it's not work! Sandy & Margaret. Fabulous experience at Cuil Lodge, from the welcome from Sandy, to the beautiful room with thoughtful touches, to the delicious breakfasts. Go to the Fairy Glen! Wonderful location. Room had great views and everything had been thought of. The welcome and thoughtfulness of our hosts was outstanding. We must go back - and for longer! Good food at Ferry Inn. Thank you P&R, was good to have you stay if only for one night. We hope you're both enjoying the outer islands now. Very warm welcome as usual. Lovely stay. Delicious homemade potato scones! We absolutely LOVED Cuil Lodge. The owner's Margaret and Sandy were wonderful and they made us feel so at home. I loved everything about the rooms, breakfast and their sweet dog Staffa. I wish I could have stayed there for a week! We loved the Ferry Inn restaurant and our favorite place to visit was the Fairy Glen, it was so beautiful. Thank you K&J, Staffa misses you! Very very good. Simple as. Hi D. Thanks for your kind words. We're just glad you got to go on your trip to St. Kilda. All the best. We were made very welcome on our arrival and a table was booked for us in the nearby hotel for dinner (really good food in a nice dining room). We really loved our luxurious sea view room which was full of lovely touches and was so comfortable. We were very sorry that we forgot to eat the home made sweets from the fridge! We also thoroughly enjoyed our delicious breakfast chatting at the table with the other guests. We were at Cuil Lodge on may 10th and that was super. And now for the second time we felt like home again. It was one of the best B&B's we have ever been. Very nice room and great breakfast and Sandy and Margaret were the best.We felt a bit like home. Thank you Sandy and Margaret. We had diner in the Ferry Inn.Good price for good food. Hello A&C, thank you for writing such a kind review of our place. It was great to have you here, twice in a few days! We hope you are having a great time at your next accommodation. All the best! We've stayed at many, many B&Bs, never have we felt so strongly about returning to this one, with top notch innkeepers, as Margaret & Sandy. They made us feel as if we were home in the most glorious of places. Already have recommended this gem to dear friends. Look forward to returning!!! Stay longer than 3 days...so much to see & more of Margaret's delectable cookies & candies to eat!!! Super friendly, and helpful. Great location in a beautiful area. Excellent breakfast. Hike the Fairy Glen and the Quiraing. Get the fish and chips from the Ferry Inn. Hello I&S! Thanks for giving us the feedback, we appreciate it. Hope your enjoying the rest of your travels. Faultless. Beautiful house with the perfect hosts. You will not find better anywhere. Don't miss the Ferry Inn. A great little pub run with passion and enthusiasm....and with a great kitchen...outstanding food! Thank you D. We appreciate you taking the time to write a review. We're glad you enjoyed your stay and that your trip to St Kilda was so worthwhile. Thank you J&B for staying with us and sharing your thoughts. We appreciate it. Hope you're having a great time on your onward travels. Ferry Inn... great G&T. Stay a few nights. Great B&B to come back to and relax after a day out. Great food at nearby Uig Hotel, where staff are very friendly. Cuil Lodge is a good base for seeing the sights of Skye and also for the nearby ferry to the Outer Hebrides. The setting of Cuil Lodge, overlooking the water is very scenic. Very welcoming, thoughtful and hospitable. Evening meal at Uig hotel was very good. Many Thanks to Sandy and Margaret who were the perfect host and could not rate this beautiful B&B any higher it was wonderful. Apart from looking at the scenery and trying to spot the otter it was an idealic location. We had a very good meal at the Uig Hotel andsampled the local Isle of Skye Eilien beer. Thank you G&B, it was great to have you staying here. Hope your time on the outer islands has been boosted by this fabulous weather we've been having. All the best! Wonderful warm welcome from Sandy, Margaret and Staffa. Another absolutely delightful stay in a beautiful house, superb location with the perfect hosts. Spotlessly clean, extremely comfortable and everything you could possibly need. I wouldn't want to stay anywhere else ! Exceeded expectations in every way! Sandy and Margaret are the best. Welcome, friendliness and comfort are second to none. Of all the places we have visited in our extensive travels,this establishment takes some beating. There are many walks of all standards of difficulty in the surrounding countryside, with lovely scenery and there are good resteraunts locally. It was great having you both here. Many thanks for taking the time to write a review, we always appreciate that. We hope you're having a great time out on the outer islands, despite the weather! All the best. This is now our third stay with Sandy and Margaret having been one of their first guests shortly after they opened a few years back. The standards at Cuil Lodge remain as excellent as they were when they first started and it truly feels a home from home. We stay every year on our way to Harris and are already booked for another stay in 2018. The convenience for the ferry, the location, the comfort, the hospitality of Sandy and Margaret as well as the overall exceptional and exemplary standards of Cuil Lodge make this an unrivalled place to stay on Skye. The Ferry Inn is finally open for business after a three year renovation project. We were only able to experience the bar because the opening of the restaurant was delayed (again) by one week, but I have no doubt when it does finally open it will be worth a visit for something truly different and unique on the island. Meantime the Uig hotel remains good for a meal after the long drive up to Skye. Thank you Kate & Vish, it was fun having you guys here. Very friendly and eager to help with where to go, how long to budget at each site and how long it takes to get there. Even lent me a map which was more detailed than mine and made navigation easy. Breakfast was top notch. Would recommend without hesitation. Location was great for Faerie Glen, Quiraing and Kilt Falls. Uig Hotel (recommended by Sandy) had great food for dinner. The scallop appetizer there was exceptional. Our party had mixed reviews of the tea room down by the ferry. I personally would avoid it. We had a nice meal at Comubmo 1400 in Staffin. Also, if you just want to relax, this B&B has a view you can enjoy for hours. Many thanks for taking the time write a review. It's very much appreciated. We're glad you all enjoyed your stay with us, we enjoyed having you here. Wonderful place to explore the besuty and wonder of the island. The breakfast you prepared for us was beautiful and delicious. The advices you gave us were all of great help to make our trip such a memorable one. As you wrote to us, even in winter, the scenery never closes! Thank you! You can ask Sandy for any kind of information! We only stayed one night however, Sandy and Margaret could not have been more welcoming. The homemade sweets and shortbread in the room with fresh milk for tea and coffee were especially lovely. When we arrived Margaret booked us a table at the local hotel for evening meal, the food was fantastic. Walking back to Cuil Lodge we were again met my both hosts who offered us coffee and tea with home made ginger biscuits. Sandy and Margaret could not have been more attentive. We would love to come back and definitely recommend to anyone wanting a comfortable, friendly environment to stay. The Uig hotel has a fantastic menu, we can recommend the Scalops and pigeon. Be guided by Sandy and Margaret. Hi Dave, hi Jane. Many thanks for taking the time to write a review of your stay with us. We enjoyed having you here and we hope you both had a terrific time during the rest of your trip. All the best! Cuil Lodge was one of the top 3 places I stayed in all the U.K.! The hosts, Margaret and Sandy, were welcoming, generous and kind! Imagine home made cake and tea upon arrival! I highly recommend this stunningly beautiful setting to anyone interested in sea views, absolute silent nights and delicious breakfasts!!! What more could you ask for? You can say no more than it is excellent, the place , the welcome and service , Sandy and Margaret are the nicest people you should wish to meet ( not forgetting Staffa ). Thankyou so much , we should not hesitate to return. Posizione molto bella, in riva al mare, stanza e bagno curate nei minimi particolari, molto pulito, colazione ottima Sandy e Margaret due persone molto disponibili simpatiche....un bellissimo soggiorno!!! Very welcoming. 5 star accommodation. We highly recommend staying here for a comfortable and relaxing break. Lots of nice touches you don't get in other places. Sandy and Margaret treated us like good friends. Breakfast was superb with special requests catered for with no fuss... porridge to die for! Skye is an amazing island and Uig is the gateway to the Outer Hebrides so there is plenty to see and do. Well organized. Very accommodating. Extremely friendly. Great location when planning to walk Northern trails. Great location when catching ferry to Harris/Lewis. the hosts were extremely kind and accommodating. We had a beautiful room. The drinking water is spring fed, a real plus when traveling to have excellent water. We were very pleased. Walk to see the fairy glen! Fairy Glen is a short enjoyable walk. The walk to Neist Point really does blow away and cobwebs... Food at the Uig Hotel is first class. Our stay could not have been better, a warm welcome, lovely breakfast, lovely homemade cakes and chocolates, 3 guest lounges with great views as did the bedrooms. Great attention to detail. Very very nice. Really gorgeous accommodation and stay. The breakfast was first rate - a 5 star stay all round. Sandy and Maggie are very welcoming and helpful. The views over the water are so relaxing and the location is convenient to the pub and town plus very close to the ferry. Recommended. Would recommend dinner at the 3 Chimneys restaurant - 5 star delicious food; pricey so check if it's where you're at. Recently my wife and I stayed one night at the Cuil Lodge and were warmly greeted and treated by the owners. This B&B has recently been upgraded throughout and was very clean and modern. The views from the front side of the house are lovely as they look out onto the Uig village and harbour. The Cuil Lodge is situated a short distance from the main part of Uig village on a side road toward the water but is quite easy to find especially when using a GPS. Our room was on the second floor and looked out onto the harbour. The owners were very attentive and assisted with our luggage on both arrival and departure - they truly seemed to appreciate our having chosen their location. The breakfast was plentiful with several choices. 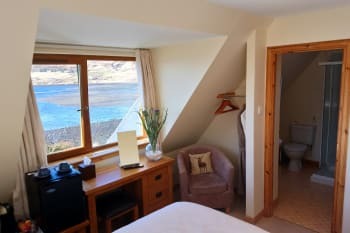 When booking try if possible to get a room with a view of the Uig village and harbour. We ate our late afternoon / early evening meal at the Uig Hotel which is close by and was an excellent choice. A drive along either or both sides of the valley on the opposite side of the A87 from the Cuil Lodge is well worth the time and effort. Both roads are single track but the views from each side of the valley are fantastic and the part near Castle Ewen in Fairy Glen is great for hiking. Stay at least 3 nights. Received a warm welcome and enjoyed the coffee and homemade gingerbread offered to us on arrival. Room very comfortable. Breakfast delicious. Hosts very helpful and friendly. We had a lovely stay at Cuil Lodge. Sandy and Margeret really makes you feel welcome. A 12 to 15 min walk to Uig hotel where you find good food, Sandy takes care of booking the table. 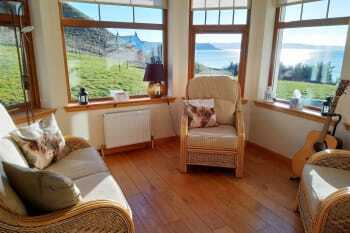 Cuil Lodge is set in a beautiful location looking out across Uig and Uig Bay. Our room was well equipped and very comfortable. Sandy and Margaret are excellent hosts and made our stay very enjoyable. We had an excellent meal at the Uig Hotel. Best to book a table though. The owners are excllents hosts. They have a lovely Lodge with large guest rooms. The rooms have all the modern conveniences one might need: hair dryer, shower gel, shampoo, an espresso machine, tea kettle and a couple of delicious biscuits. The location works particularly well for folks who like to walk. We enjoyed walking to town (1.5 miles away), and to the Uig Hotel (less then .5 miles away). The breakfasts were wonderful with all the trimmings. The Lodge looks new and it was a pleasure to stay there. We highly recommend this facility. The nearby Uig Hotel has good food and a nice Pub. It is also an excellent location to watch the sunset. We also enjoyed walking to the Fairy Glen, about a 30 minute walk. Lovely in every way. Particularly grateful for the ferry terminal petit fours drive-by! 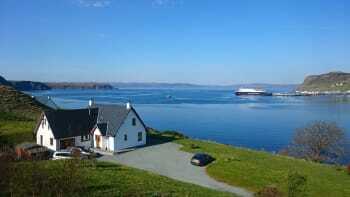 Great location for the Uig ferry! Everything about this stay waa first-class. Wonderful hosts, fabulous cooking, not only at breakfast time, but afternoon tea and in-room treats as well. Beds very comfortable. 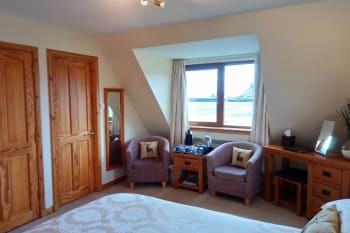 I would highly recommend Cuil Lodge if you're looking for accommodations in Uig. Lovely hosts that are very responsive and attentive, a few mins drive from the ferry, good sized room with a beautiful view of the water. What really set this B&B apart for us was the attention to detail, the thoughtfulness of our hosts and the seriously comfortable bed - the most comfortable bed of all the B&Bs on our trip! Make dinner reservations in Uig ahead of time - we didn't - and got stuck driving 20+ mins to Portree for dinner. Wish we could have stayed longer to experience the exceptional service. Touring around the Trottenish peninsular rewarding. Very nice coffee shop by the road approximately 3 miles north of the Flodigary Hotel. The exceptional view over Uig harbor is just one of the charms of this fine B&B. Well appointed and comfortable room, outstanding breakfast, and super hosts. Margaret and Sandy are extremely knowledgable about walking and hiking opportunities on the island and the wise guest would consult with them before venturing out. We arrived soaking wet, but our hiking clothes were returned to us the next day, dried! We call that above and beyond outstanding service. A pleasant walk to the Uig Hotel for dinner makes this the ideal stop in Skye. Fab accommodation, breakfast was amazing! wonderful hosts who go out of their way to make your stay comfortable and enjoyable. Uig is a lovely location and Cuil Lodge is very handy for getting the ferry to Harris. highly recommended. Very friendly and helpful hosts, beautiful location, excellent breakfast, nice and clean room with a beautiful view. We really appreciated everything. Outstanding hospitality with lots of special touches to make our stay so enjoyable. Delicious breakfast. Absolutely wonderful ! Couldn't do enough for us and made us feel really welcome. Very comfortable, large room. Lots of special touches including home made muffins. You have really thought about what it is rravellers need - including peoviding comfortable spaces to enjoy ths wonderful uninterrupted views of the harbour and coastline. Breakfast was excellent - didn't eat all day afterwards! Thanks for the recommendation for the hotel nearby for supper - lovely food. Don't forget to go to the fairy glen ! Wonderful, pampering hosts. Fabulous accommodation. Idealyic location. Just do it. Stay here! Excellent place and lovely person. Sandy Margaret and Staffa welcomed us with great kindness! We absolutely recommend. A wonderful place to stay, quiet with a beautiful view, very friendly hosts. The only thing we are sad about is that we had only one night at cuil lodge. We will come back and stay longer. Very comfortable. A nice place and people, where it is worth to stop and rest. That enriched very much our visit to Skye. Wonderful hosts. Just the right level of interaction with guests. Margaret's home-made chocolates a real piece of luxury which matched the luxurious accommodation and wonderful food at breakfast. Can recommend Uig Hotel for food. Excellent in every way. Lovely people, immaculate accommodation in a fantastic location with lovely extra touches making for a very special stay. Fantastic breakfast too! A few minuntes from Uig Pier ideally located for boat trips. Trip to St Kilda is the experience of a lifetime! Visit the Fairie Glen early morning - stunning! The Uig Hotel serves lovely food and excellent service from very friendly staff. Everything was lovely. Unfortunately I can only rate 5, but I would rather rate 10 or...1000! Great stay! Es war sehr schön. Die Vermieter sind sehr nett. Since the B&B is quite far from Restaurants, you could bring your own food to dinne and Sandy & Margaret will prepare the table for you. Sandy & Margaret were fantastic hosts. Very nice, funny and a pleasure to talk to. And breakfast was delicious. We will recommend ad/or come back. My Son and I loved it, we felt we had made friends with Margaret and Sandy, it would be really nice to see them again. If you are looking for a top quality bed and breakfast in a stunning location Cuil Lodge will be perfect for you. The food in the Uig Hotel is excellent. You can go on a non landing cruise from Uig port over to North Uist or Harris which is a very nice way to spend a few hours. We were sad to leave. Cuil Lodge is a wonderful home base from which to explore the Isle of Skye. We could not have asked for anything more. From the warm welcome to the last good bye, everything was perfect. We enjoyed the bountiful breakfasts served by Sandy, the hot tea when we came in cold and wet, and Margaret's homemade shortbread cookies. Cuil Lodge is a very special place. The lodge is a nice walk to a very good restaurant, and about 1.5 miles to the tiny village of Uig. The Trotternish peninsula is particularly beautiful on an island of outstanding landscapes. My family and I had a really nice stay at Cuil lodge. Margaret and Sandy are really attentive to their guests. The view and the Uig bay is gorgeous. The house is really comfortable, clean, cosy and nicely decorated. This was definitively the best B&B we had during our road trip in Scotland. Good diner at Uig Hotel Old man of Stor, Kilt rock. The coral's beach, Dunvegan castle. Margaret and Sandy have provided the finest lodging experience ever. They have anticipated every need of the traveler. In addition to making visitors to their neat, clean, stunning accommodations feel genuinely welcomed, they are particularly willing to help out with travel plans, reservations and strategic advice. We heartily recommend their lodge for a very pleasant stay, however long or short, but admonish travelers to book this spot well in advance. The Cuil Lodge is exceedingly popular! We enjoyed our dinners at the Uig Hotel. Ella's serves fresh, homemade bread, soups and salads.Our sort care trip to see the Curang was very rewarding as far as dramatic viewings of singular land formations. A short hike to Fairy Glen is in order as well as other, longer more challenging hikes for incredible vistas. Sandy & Margaret were superb hosts taking the time to talk with everyone and worked hard to make the guests feel at home. One of the best B&Bs we have ever stayed at. You really made us feel at home; thank you for your hospitality. Isle of Skye is an awesome place to visit. Whatever sounds good to you, go do it! If it rains, you won't melt. Sandy and Margaret will point you in the right direction if you let them know what kinds of things you like to do. Best B & B we have ever stayed in. I have never given a review before but wanted to this time as this B & B is exceptionally good. From the friendly, welcoming hosts to the seating areas downstairs to the really comfortable bed to the home baking to the magnificient views... Simply fabulous! We stayed in peak season and were fortunate to get a lovely meal at the Uig Hotel. Great steak! However it was really busy and they had to turn people away partly due to a wedding party I believe. Booking ahead for dinner is probably a wise move as options are very limited at Uig. We could not have picked a more friendly and beautiful place to stay in Uig. Margret and Sandy took care of all our needs with a smile. We loved their dog she was lovely. The breakfast was very good. All the rooms have great views, but the front rooms have the best. Margaret, Sandy and Staffa welcomed us into their home with warmth of old friends. Nothing too mych trouble and facilities outstanding from luxury towels and bedclothes to coffee maker and home made tablet (fudge) to amazing view over the Harbour. Scrumptious dinner at the Uig hotel. We are already planning out next trip back! What a beautiful house and a great location right on the water. All the sitting rooms were particularly nice after a long day of travel. The mini fridge in the room was a nice touch to keep drinks cool, first time I have seen that at a B&B so it was a pleasant surprise. We loved having breakfast with other guests sitting at the same table. It didn't feel awkward and quiet in the morning, but instead was a lovely way to get to know other people from around the world. The hosts are very friendly and accommodating, we enjoyed talking with you! Can't wait to come back! An excellent place to stay. Sandy and Margaret are wonderful hosts. Very friendly and warm welcome and we would have no hesitation in recommending Cuil Lodge. We will definitely return! Hopefully not too long before the Ferry Inn starts serving food as the Uig Hotel mediocre. We posted a review on TripAdvisor and don't think we could have been more complimentary. We also reviewed some nearby restaurants & activities on TripAdvisor. We had a wonderful stay at Cuil Lodge, everything was just perfect. Sandy and Margaret did a splendid job and we enjoyed their beloving manner of really taking care of their guests in any manner. We want to come back as soon as possible. For tips and tricks about Skye ask Sandy and you will be happy! Very hospitable and warm hosts . Beautiful spot. Lovely house. Lost of nice touches - fridge in room with fresh milk and home made sweets, lovely fruit for breakfast etc. Everything clean as a whistle. Friendly owners. We stayed twice, but for only for one night each time - as we were travelling by ferry to and from the Western Isles. But would like to go again and stay longer to explore Sky. Highly recommended. Food in Sea Breezes in Portree is excellent - just book beforehand. Very warm welcome on arrival. Sandy greeted us with a pot of tea and lovely home baking which was much appreciated after our long drive. Room was immaculate with lovely bedlinen. Breakfast was fabulous, lovely fresh fruit and delicious cooked breakfast. 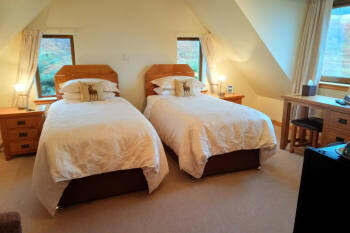 This B&B has been well thought out with great attention to detail, everything of a very high standard. Sandy & Margaret are the perfect hosts. Great location to catch the ferry to the Isle of Harris. 2 minute journey to Uig ferry terminal. Uig Hotel is walking distance from the B&B, where we enjoyed an evening meal. The Ferry Inn is also within walking distance where we enjoyed a drink. Very peaceful with beautiful views. Attentive friendly hosts. Delicious handmade goodies. Cuil lodge is just one of the best b&b you could wish to find anywhere in Scotland, clean, friendly hosts and a very good breakfast. must have the smoked haddock for breakfast it is the best ever and try the local walks!!!!! All the tips/advices that you gave us were excellent! Nothing else to add as we followed your indications. Loved the location, situation, and breakfast. The genuine friendliness and helpfulness of the hosts was outstanding. Sorry that we could not stay longer. Make sure to book ahead in Skye in the summer as the B&Bs fill up. Sandy & Margaret are second to none excellent hosts, nothing is to much trouble to make your stay a fantastic one. They also cater very well for people with food allergies you will be safe in there hands. A remarkable couple, many thanks for making our stay one to remember. The Uig hotel is a very good place to eat if you need gluten free this is the place to go, just let them know and they will accommodate to your needs. Faultless. We were made to feel very at home from the moment we arrived until we left and we were only staying for one night. Everything was tastefully done. We felt like old friends rather than paying guests. Stay more than one night if you can! Uig itself has little choice in eateries (local inn not yet fully functional). Sandy booked us into the Uig Hotel for dinner - a 2 minute drive (when weather is inclement). The food there was great but be warned - the fish and chips would better be described as whale and chips! We have used B&B's throughout Europe and the Cuil Lodge was just amazing. Great location on the beautiful Isle of Skye. Only 1 real restaurant in town (Cuil Hotel) which is decent. Make sure to stop over at the Ferry Inn though and have Gordon make you a drink. Great guy to chat with! This was our second stay at Cuil Lodge and as per the last visit it was perfect . Often wnen returning to a place one remembers as being excellant one is disappointed . Not in this case .Question is ,is this the best B&B in the UK . Good luck Sandy and Margaret , but I know you don't need it . What a comfortable, well equiped & tidy home in a stunning countryside! The hosts Sandy & Margaret Borland and Staffa (Weimaraner dog) are really great people and help with everything they can without being officious. The breakfast is excellent and Maragaret is good baker too (there's always a piece of cake besides your afternoon tea). The wonderful relaxing 2 days at the Isle of Skye were a highlight during our 1-week visit of Scotland. The Uig Hotel is pretty close (12 minutes walk) and a very good option for having a dinner. If you like to walk and hike you're also at the right place, close to "Quiraing" and the "Old Man Of Storr". Sandy & Margaret lend us their maps. Really appreciated fresh milk for my morning tea in the bedroom's fridge. (Tea tastes so much better with real milk.) There were also home made chocolates in the fridge! Sandy and Margaret were lovely people, friendly and helpful but not at all intrusive. The Borlands recommended The Uig Hotel. We ate well there. Wonderful b&b, hosts Sandy and Margaret couldn't be more helpful or friendly. Gorgeous location and very handy for the ferry to Harris. Lovely breakfast and lively conversation with other guests. Got our holiday off to a great start. Lovely evening meal at the Uig Hotel. Fill up with petrol before going to Harris! Beautiful location and building. Perfect hospitality. Great breakfast. We will definitely be back. Best place and the most wonderful kind,warm,knowledgeable owners.We would stay here again in a heartbeat and cannot recommend it highly enough. You will enjoy their excellent accommodations but it is their attention to detail that takes Cuil Lodge to another level. Every effort is made to make you feel special and at home all at the same time. From home baked shortbread to local toiletries to suggestions for walks-the list goes on and on. Skye is an amazing place and Uig is a convenient location to see it all. The Uig Hotel is just short walk from Cuil Lodge which is great when you are tired from all your adventures. We also enjoyed the Orasay Tea Room in town for delicious lunches and the best lemon drizzle cake. beautiful house, great lake view, clean and cute room,friendly and charming dog, but most of all, welcoming, nice, kind, lovable and worm hosts. highly recommended. Absolutely perfect. First class location, amazing views, immaculate rooms with every comfort you could wish for and outstanding hospitality. Sandy, Margaret & Staffa are wonderful hosts. Always my first choice when in the area. Margaret and Sandy are a wonderful couple! They welcomed us very warm and it felt more like a familiar welcome than a "normal" one. You can see in each detail, how much joy and love is in their BnB. Every morning we got a delicous breakfast with food from the Isle of Skye. We are very grateful that we met these both wonderful people and their dog Staffa, which is really a funny one :) Thank you!!! You definitely need to stay longer than we did. We´ve had only 2 days. Isle and Hebrids invite you to stay much longer! Sandy & Margaret were the perfect hosts..It really is a lovely place to stay. Beautiful view of the harbour at Uig and the cuckoo calling at 7am in the morning couldn't have been a better alarm clock!!. Would thoroughly recommend.. Warm welcome and attention to detail. Much appreciated. excellent hosts, friendly all the time. Cuil Lodge is a very comftable accommodation. We enjoyed our stay at this lovely place. Many thanks for a warm welcome and a fantastic breakfast. Thanks to your advise we have a very good dinner at the uig Hotel and a nice evening with live music. This was our second visit to the Cuil Lodge and it was exceptional. We stayed 4 nights this time because the owners are so fabulous, the house is immaculate , the location can't be beat and the service for the price is excellent! The hosts go out of their way to make you feel welcome and they truly know the area. Lots of great recommendations for things to do. I'm glad we got to stay longer and enjoy the beautiful Isle of Skye. This location is so much better than staying in Portree or any other city. We love this B&B! Go to Fairy Glen, it's very close to the B&B. Stay longer than 2 nights you need more than that to experience the natural beauty of the area. Ask Sandy about the drives with great views and don't miss the Quiraing and the old Man of Store. The Puffin and seal tour from the Uig Dock is great, 90 minutes for 20 pounds . Book ahead because Andy only Takes 6 passengers each trip. As last time (2 years ago) we enjoyed our stay at your lodge very much. It was like meeting friends. We would highly recommend this place to everyone who is interested in an excellent accommodation in a perfect surrounding. Dinner at the Uig hotel is very good! I don't know what is the more important reason for one more visit to Skye. The beautiful landscape or these wonderful people Sandy and Margaret ? Anyway we will come back for sure someday ! Welcoming and dedicated to making our stay comfortable and memorable. Our hosts were knowledgable on where to go and what to see. Thank you Sandy and Margaret. Mace shop by ferry terminal has a good range of OS maps of the Hebrides. Very friendly owners Sandy & Margaret & of course Staffa the family pet. 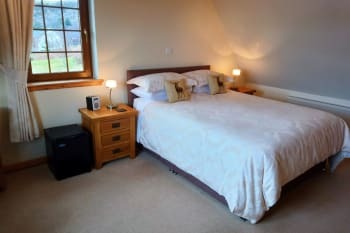 Very comfortable stay with a high recommendation for anyone wanting accommodation on Isle of Skye. The hotel close by was recommended for the evening meal which was excellent with Sandy even making the booking for us. We stayed at Cuil Lodge for one night on our way to Harris ... wish we could have stayed much longer. Sandy & Margaret are the perfect hosts. Especially liked the personal touches e.g. homemade chocolates, personalised breakfast (wonderful selection). Bed was super comfortable and views across the bay were stunning. Highly recommended - look no further. Ferry Inn is a very short walk from Cuil Lodge (maybe 5-10 mins). Two real ales on tap and a good selection of wines and whiskies). Couldn't ask for more from a b & b. The hosts are very welcoming and friendly. This is our 2nd time staying here and would definitely stay again. Thank you for great hospitality, your place is just fabulous! Allow sufficient time to see Skye. It is quite big. THis is an immaculately presented property in a great location. THe hosts are very hospitable and attentive. I will definitely return. Great place to stay. Clearly the best B&B we stayed at during our visit to Scotland. It was new, maintained very well and the food was very nice. Sandy and Margaret were delightful hosts! Thanks for getting up so early to provide a breakfast at 5am!! Above and beyond what we would have expected. Lovely friendly welcome. As hosts you could not be more welcoming, friendly and informative you certainly made us feel at home very quickly. The room was bright, airy and immaculately clean and stocked with everything necessary, plus a few extras besides. Breakfast was delicious, best smoked haddock I have tasted, with a varied menu that would suit all tastes. The only downside for us was that we could not have stayed longer, will certainly recommend you to all we know. Finally thank you both for a wonderful stay and your very enjoyable company, and lovely Staffa for just being Staffa. There are not many places to eat out, we dined at the Uig Hotel restaurant and had a very good meal there, but do book ahead, it was fully booked in the evening. What a great place! In every way, this is a very pleasant place to stay and I can unconditionally recommend it. Uig is probably one of the prettiest places on Skye, and Cuil Lodge's location takes full advantage of the beauty. Sandy and Margaret made us feel very welcome. The standard of service they offer is very high indeed. From offering us tea and home baking on arrival to the hand made chocolates in the room, these are the things that make you come back. 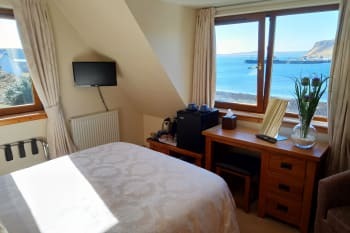 The room was lovely, comfy bed, excellent shower, good views across the bay, coffee maker in the room which was nice and has everything else you would ever need. There are also a number of lounges/areas you can use so no need to stay in your room. Breakfast was excellent, well presented and very tasty (try Margaret's home made potato scone - delicious!). Would recommend the Cuil Lodge to anyone who is on Skye. Good base and feels just like home. Sandy and Margaret are excellent hosts. We ate at the Uig Hotel for dinner (booked for us by Sandy which was good) only a short 10 minute stroll from the Cuil Lodge. Service was excellent and the food was good too. A beautiful B&B in a beautiful setting. And Staffa the dog is an added bonus! Cannot fault this place. Sandy and Margaret are perfect hosts and there are extra touches which add to the overall experience. Perfect stay, as always;faultless. The new shelving unit in the bathroom is a welcome addition. Convenience and comfort for the early morning Calmac Ferry to the Western Isles, is unrivalled. The Fairy Glen is worth a walk to, about two miles along the first turning on the left after the Uig Hotel as you leave the town. Speaking of which, the Hotel is as good as always for dinner and we await the re-opening of the Ferry Inn Restaurant after many years of renovation, said to be imminent. Looking forward to trying it next year, when we'll be back once again. Everything was perfect. Your welcome was really warm, and friendly. Breakfast and homemade cakes were amazing ! Thank you so much ! For dinner, try Uig Hotel! Great view and great food ! We always receive a very warm welcome from Sandy and Margaret and Cuil Lodge is always our first choice when staying on Skye. The rooms are lovely, spacious and very comfortable with fresh milk, homemade chocolates and good hot showers with fluffy towels. Sandy and Margaret are perfect hosts and go out of their way to make our stays perfect no matter how short. Fabulous breakfasts - porridge is a must as is the homemade granola (actually just try everything - you won't be disappointed)! Uig Hotel serves good food with fresh local produce on the menu and a vast array of Whiskey. Friendly, warm and informative. Nothing was too much trouble. If we are on Uig again we would definitely return. It was all the little touches: The little fridge, the chocolates, the toiletries, the biscuits - homemade. The coffee machine- pity no decaf, the quality of the decor e.g. bed linen and towels, oh and all the extra space for guests. We are so lucky to have found this wonderful Bed and Breakfast, right by the side of the Water and so handy for the Ferry over to Harris. Sandy and Margaret are such a warm welcoming couple and there home is just really beautiful, spotlessly clean and they have thought of everything a traveller could need. What a fabulous Breakfast and such a choice on the Menu, we could not have chosen a more lovely place in the most wonderful spot in Uig. If you don't like dogs then don't worry as Staffa is the most beautiful friendly dog who loves having her Tummy rubbed, you could almost see the smile on her face!!! Thankyou Sandy and Margaret for such a lovely stay, we wished it could have been longer. If you are a walker then of course there are a lot of walks to do and for dinner we went to a local hotel and Restaurant for the most delicious meal, this was recommended by Sandy and Margaret. The Ferry to Harris is just around the corner, so handy. Posizione strategica non solo per il traghetto ma prr la presenzs in loco di buoni ristoranti. Excellent service! Excellent space! And the hosts are way chill and relaxed. A perfect end to the day especially as the rain came in. Just hang out inthe lounge and take it easy. Our stay was everything we wanted and needed. After two weeks of traveling, this is the one place we truly felt like we were coming "home". Sandy and Margaret provide wonderful fine touches from three extra rooms to relax with books, movies and music to water and homemade chocolates in your personal refrigerator. We had the most comfortable bed and feather pillows of any other B&B, gorgeous scenery, expert knowledge of the island and delicious breakfast. Sandy and Margaret are superb hosts and their B&B is beyond expecations. We stayed in Scotland (mostly the Isle of Skye)for three weeks and Cuil Lodge in Uig was our favorite location/accommodations and hosts. Sandy and Margaret went out of their way to make us feel welcome and provide for our comforts. They were a large part of what made this the best vacation we have ever had! The Uig Hotel Restaurant is fantastic! Uig is where the ferry terminal is to travel to Harris/Lewis as well. Nearby is the Fairy Glen, the Skye Museum of Island Life and the burial site of Flora MacDonald. Fred and I thoroughly enjoyed our stay at Cuil Lodge. Sandy and Margaret were welcoming and very eager to help us plan our time on Skye. We appreciated all the little extras - water and milk in the room fridge and Margaret's sweets! Margaret and Sandi were great hosts. We felt very welcome and at ease in their home. We had a limited amount of time on Skye and Sandi was very helpful in making suggestions on different activities we might enjoy. He also had maps and info for us to use. Our large comfortable bedroom contained all needed amenities plus more. We had a many choices for breakfast which tasted great and presented very artfully. The sitting areas all had beautiful views of the water. We enjoyed our stay at Cuil Lodge and definitely will return when visiting Skye. Sandy and Margaret were amazing hosts. The B&B has a beautiful view across the harbour looking at UIG. The homemade treats, evening tea and breakfast were delicious. The rooms are spacious and very clean. The stay on Skye with Sandy, Margaret and Stafer was one the highlights of the trip to the UK. Our first B & B and it was lovely! Margaret and Sandy were perfect hosts, their house is absolutely immaculate and the food delicious! We highly recommend. Spend at least a couple of days, the Isle of Skye is beautiful. Very nice, helpful but perhaps too in your face on occasion. Sandy & Margaret were the most accomodating,attenative,and very friendly host and hostess that my wife and I have ever experianced. They both made my wife and I feel very welcomed and were great to conversate with over the many places to visit and sight see throughout the Isle of Skye. We look forward to going back to the Cuil Lodge and visiting with Sandy and Margaret on future visits to the Isle of Skye. Margarets home bakes and Breakfast are the BEST on the Isle!! Staffa is just as pleasant to visit as Sandy and Margaret. Our whole experiance at the Cuil Lodge with the scenery,Sandy and Margaret,Staffa,and the Great food will be a treasured memory that my Wife and I will shall keep for a lifetime. Lovely B&B in Uig on the water. Breakfast and rooms were excellent. Hosts were very welcoming, friendly and attentive. Highly recommend. Very welcoming and very comfortable stay. Very good breakfast & great advice re-local eating establishments & ferry information. Ask your hosts!! Very friendly & useful information. Our brief stay at Cuil Lodge was the perfect start to our holiday, and the very high standard set the bar, and the tone for the rest of the week. Your welcome, your lovely home, the wonderful facilities and the great breakfast could not be improved upon. Thank you. Just passing through on this occasion, but clearly the ideal place to stay if catching the early ferry. Our stay at Cuil Lodge was very comfortable, our every need catered for. Sandy and Margaret made us welcome with delicious home baking and a sumptuous breakfast. We would love to come back for another visit. Uig Hotel is only 15 mins walk from Cuil Lodge and they provide excellent food and wine. Amazing welcome with a cup of tea. Always nice, smiling and helpful. Rooms very comfortable. Fairy Glen walking is lovely. Eating at the Uig Hotel by sunset. Margaret's delicious muffins. Lovely location with amazing sea views. Great hosts who made us feel extremely welcome into their beautiful home, Margaret even provided her own handmade chocolates which were delightful. Sandy is great for local knowledge and suggested we should walk to fairy glens which was an amazing experience which should not be missed! Sandy and Margaret have been delightful hosts and we felt truly welcomed into their homes. The house was ideally situated with gorgeous views across the bay and the rooms were comfortable, spotless and had all the amenities we needed. We loved the thoughtful touches, such as the delicious home baked cookies and handmade sweets specially prepared by Margaret that awaited us. Breakfast was of elegant sufficiency and we were always full! It was also wonderful chatting with both Sandy and Margaret and learning more about island life as well as getting their advice on walks and where to eat. All great recommendations. Last mention to Staffa, who welcomed us in her own friendly way. Kudos to Sandy and Margaret for running a lovely B&B and we would definitely recommend to anyone. Thank you guys! Uig Hotel has delicious, reasonably priced meals and drinks. The cheese platter was divine. The Fairy Glens is a pretty little spot to visit however can get busy with other tourists. The views atop Beinn Edra are simply stunning and worth the hike up. Terrain was very boggy in some areas so make sure you have good waterproof hiking boots! And half the walk does not have any marked trails. Hard to fault this place! Perfect for ferry watching. A trip to the Ferry Glen is a must - such an unusual landscape. Wonderful Place, very friendly hosts, excellent food! Had good fish & chips at cafe next to petrol station! Wonderful couple (plus Staffa :o) Sandy gave us very helpful tipps where to go and what to see. Extremly good breakfall. Big rooms, everything very clean and tidy. A stunning view to the bay. Highly recommended!